From the drama The Walking Dead to the peppy teen comedy iZombie to the literary parody Pride And Prejudice And Zombies, the zombie apocalypse concept has become such a popular trope in today’s world that it is spilling over into just about every genre of entertainment. This year you can bet there will plenty of ghouls and zombies out on the Halloween trick or treat circuit, and the holiday is a perfect excuse to enjoy your favorite novel featuring the dead rising from their graves to feast on the brains and flesh of the living, to provide some spine-tingling seasonal chills. So, for those of us who enjoy adventures set in the Age of Chivalry, why not reach for a story that combines a zombie apocalypse with brave medieval knights in armor? Why not? Because there aren’t too many such stories around – until recently, that is. 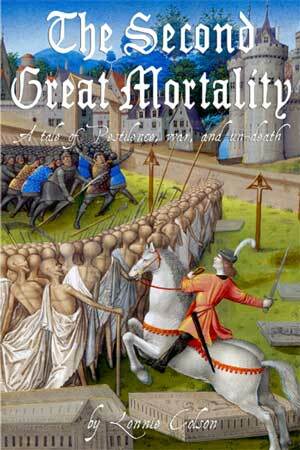 Now, everyone (including the Chivalry Today production staff) who think that zombies and knights are two great things that can only be better together, can enjoy a tale of the medieval living dead in the new book The Second Great Mortality, written by first-time novelist Lonnie Colson. For those involved in the world of medieval historical reenactment, Lonnie’s name maybe a familiar one. He has consistently been one of the top competitors in the mounted hunting and skill-at-arms games at the annual Tournament Of The Phoenix invitational joust in Southern California, and he has trained in the arts of medieval and Renaissance swordsmanship with ARMA, The Chicago Swordplay Guild, and the Schola St. George. He even has a field for riding and sword-fighting practice in the backyard of his home near Dallas, Texas. As you can imagine with such a studious background, historically accurate details about arms, armor, and 15th century medieval culture feature prominently in Lonnie’s zombie book, as they would in a respected historical fiction author like Bernard Cornwell or Sharon Kay Penman. But amongst all the battles against the forces of the undead, is there anything of the code of chivalry to be found in this medieval horror novel? If modern zombie stories force us to confront the thin veneer of 21st century civility and ethics as society falls apart, what might we learn about medieval honor and chivalry in the same situation? In the spirit of the Halloween season, Lonnie Colson joins host Scott Farrell for a conversation about knights, chivalry, and The Second Great Mortality. Learn more about Lonnie Colson’s background, interests, and continued writing projects – and get the schedule of his upcoming book-signing appearances – at his author website.